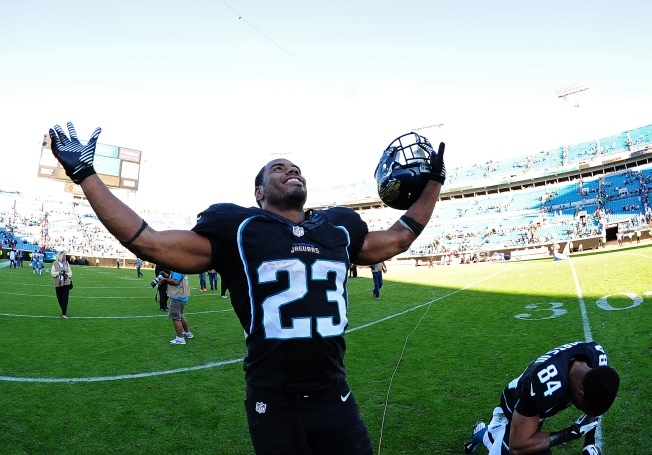 After missing the 2011 season with a knee injury, Rashad Jennings returned to the Jacksonville Jaguars last season to play 10 games. His numbers, however, were the worst of his short NFL career. After averaging 5.5 yards per carry in 2010 and 5.2 in his rookie season of 2009, Jennings averaged just 2.8 yards per carry in 2012 on 101 attempts – 17 more carries than he had in 2010. So what can the Raiders expect from the 6-foot-1, 228-pound running back in 2013, now that he’s signed with Oakland to back up starter Darren McFadden? Is he the 2010 Jennings or the 2012 Jennings? Jennings believes he’s now back to full strength after the injury and a setback with the knee last season. Jennings talked to the Packers and Broncos before deciding to sign with Oakland. He’ll replace Mike Goodson, who was McFadden’s primary backup last season but signed with the Jets as a free agent. Jennings, 28, will be reunited with new offensive coordinator Greg Olson, who was with him in Jacksonville. The new Raider said his familiarity with Olson played a part in his decision to come to Oakland, but wasn’t the sole reason. He says getting an opportunity to play for the Raiders – an organization he equates with having “eager and hungry teams” through the years -- also played a part. He sees himself as a gritty, hard-working player who can fill a role. Jennings has been versatile in Jacksonville as a ballcarrier, receiver (61 catches in three seasons) and special teams contributor. The Raiders have seen Jennings at his best. In 2010, Jennings rushed for 109 yards and a touchdown in a 38-31 victory over Oakland. The same season, he had a 108-yard rushing game against Houston.